Suspense Sisters is pleased to welcome award-winning author Lynette Sowell. Lynette and I (Elizabeth Goddard) have been friends since. . .well. . .my first writing conference in 2001. She's an amazing writer, and her new Amish series set in Saratosa, Florida is definitely something new and fresh in the Amish genre. Her newest story, releasing this coming Tuesday, is also a suspense. Please comment if you'd like a chance to enter the drawing for A PATH MADE PLAIN. Lynette Sowell is the Carol award-winning author of more than 20 novels and novellas, several of which have made the ECPA best-seller list. When she's not crafting stories, she works as a freelance reporter and columnist for her local newspaper. She was born in Massachusetts, raised on the Eastern Shore of Maryland, and makes her home on the doorstep of the Texas hill country with her husband, a duo of cats, and a Texas heeler named Mocha. In no particular order, Lynette loves coffee, chocolate, reading, cooking, watching movies, and is always up for a Texas road trip. 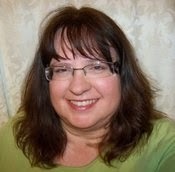 You can find her on Facebook at facebook.com/lynettesowellauthor and on Twitter @LynetteSowell. I first began writing when I was in middle school and passed stories around the classroom. But I didn't get serious about writing fiction until 1998, when I first started dabbling in creative writing again. I received my first fiction contract in 2005. Yes and no. I'm a freelance writer for my city newspaper and the rest of the time not filled by family, I get to write fiction. In the past, I've worked as a medical transcriptionist. Definitely my husband. He has cheered me on from the time it was a dream, and he's encouraged me when the going's been tough. I am thankful for him every day. I write primarily in the romance genre, but two of my more recent releases have a strong suspense thread, Tempest's Course and my newest release, A Path Made Plain. I've enjoyed putting suspense threads into the romance very much, because I love to read a good romantic suspense! I like to think my stories are filled with faith, hope, and love, whatever the topic is. If I'm writing a contemporary romance, romantic suspense, or venturing into history, I want readers' faith to be built up while they're not being preached at. I'd like to help my husband build up his homemade cookie business. He makes drop cookies and I make decorated sugar cookies. Right now, though, I'm loving the writing. mish-Mennonite village of Pinecraft in the city of Sarasota, Florida. She's far from her Ohio home and becomes a year-round resident there, living with a great-aunt. Then Thaddeus Zook roars in on his Harley. He's hiding out in Pinecraft because of some bad things that happened back in Ohio, where he worked as a pastry chef in an upscale Columbus restaurant. He's been long shunned by his immediate family, but his grandmother who lives in Pinecraft takes him in anyway. Of course, he crosses paths with Betsy, and eventually things catch up with him, and. . . The tiramisu pie. Just kidding! No matter how dire our circumstances get, God can work in ways we don't expect. Our path might change, but He's still guiding even when we don't understand it. Betsy comes into her own during this book, and I loved cheering for her as she grew. But Thad is my favorite. He's handsome in a rough-around-the-edges way, but soft and tender on the inside. He hides in Pinecraft because it's far from where he used to call home, but it still carries reminders of home. The villain. There's a thread of good in him. I wanted him to do the right thing, I did. Part of him, I think, wanted to do the right thing, especially when encountering the people of Pinecraft. But, he made his choices and he crosses the line and faces consequences. Right now I'm working on revising and editing some self-published work. I have the rights back to several books—a mystery series, and a Christmas story. So those will be released very soon. I'm mulling over a romantic suspense series I'd like to propose to Love Inspired Suspense. I'd also like to revisit Pinecraft, too, at some point—literally and in a book. I'd like to still be doing what I'm doing now, writing and selling books, whether that's through a traditional publisher or independently. I'd love it if one of my books would be optioned for a movie, but that's not something I can control. 2. Take a cathedral tour outside the U.S. I loved studying art history in college and would love to see the places I read and studied about, from England to Italy, and beyond. Made a costume out of my dorm room curtains in college. Learning to let my adult children go (ages 22 and 24). Every mom needs to get to the point where she stops “mothering” them so much. It's hard, but I'm getting better at it. If you're not an Amish fiction fan, I hope you'll check this one out anyway. It's a little different because it's set in Florida. There are no horses 'n buggies or farms. And, who wouldn't like a tattooed, Harley-riding pastry chef who grew up Amish? Betsy Yoder lives with her great aunt in Sarasota’s Pinecraft neighborhood, far from her family in Ohio. 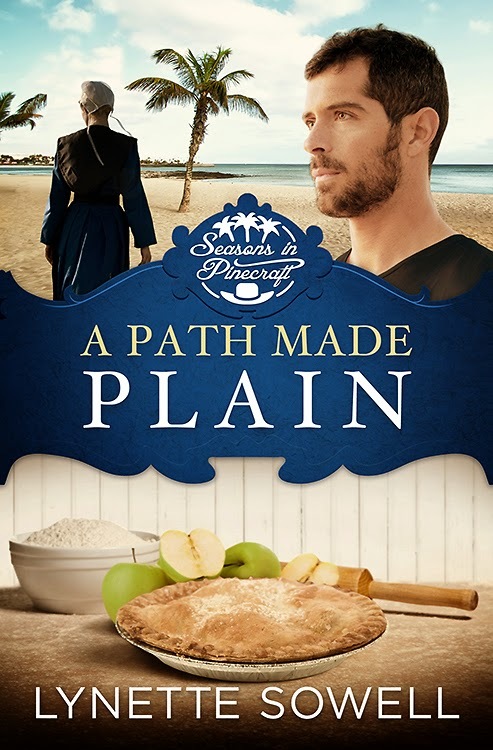 Heartbroken by a man who left her—and the Order—to marry someone else, Betsy instead pours her time and energy into her bakery, offering the village of Pinecraft delicious desserts from her Amish heritage, and is content in her hardworking yet peaceful life. Enter the formerly Amish Thaddeus Zook, a pastry chef who has moved to Pinecraft after working in restaurants among the Englisch. While Betsy nurses a hesitant heart, Thaddeus shows a similar hesitancy about rejoining an Amish community. Though neither can deny the attraction between them, Thaddeus is hiding a past that could threaten their future together and put Betsy in danger. I am looking forward to reading A PATH MADE PLAIN.I enjoy reading your books. I loved the first book in the series and am looking forward to reading this one! I'm glad you did, thanks for stopping by! Having family that is both Modern Day & Old Order I loved connecting to the characters in 'A Season of Change'. I cannot wait to read 'A Path Made Plain'!! I spent some time in Holmes County, Ohio this summer. What an amazing experience! Thanks for sharing about your book! I loved reading the first book Seasons of Change. So looking forward to reading A Path Made Plain. OH, I loved the first book too. I'm not a big Amish reader, but these books are different and definitely have a unique flavor and twists. I especially love the suspenseful twist in this story. Really enjoy your books. Thanks I would love to read this one too. This whole series is on my wish list. I would love a chance to win a copy of this book. I hope everyone has a great week. Amish and suspense in one book? Sounds great! This book sounds so good! Thanks for the chance to win it! Wonderful interview. I have only read a few of Lynette's books and have only recently started reading Amish books. This looks very interesting. I need to look for book 1 in the series. Thank you for sharing and the opportunity to win a book. Thank you for sharing this great interview and giveaway opportunity. A Path Made Plain sounds like a wonderful story! I have been reading this series, would love to win this book. My sister-in-law gave me your first book of this series to read and I did enjoy reading it. I would love to read more of this series. Thank you for the opportunity. I love a romance novel that also has suspense. This sounds like a good read. I'd love to win a copy. A Path Made Plain sounds like a wonderful book! Thank you for a great interview! This book sounds good. Thanks to Elizabeth Goddard for sending me to this site. Enjoyed the interview. I have to admit you got me with the Harley riding chef. Count me in for the drawing. New author to me. Sounds like a great book. I will have to find the first book in the series at the library. Hope they have it. I would love to win a copy of A Path Made Plain. Thanks.